TrustedID Review 2017 - Should you Buy this Identity Theft Protection? TrustedID is a solid option for families that comes with credit reports in all of its plans, but it's a bit rough around the edges. TrustedID was founded in 2004 after its founders personally experienced identity theft. Almost 10 years later, the company was acquired by Equifax, one of the three national credit bureaus of the United States. It now stands as one of the top identity theft protection services in the country. TrustedID is one of the few identity theft protection services on the market that offers family plans. Due to the especially private nature of the business, it’s usually not an option. You can add a spouse, child, parent, and other relatives to your account for $29.99 per month or $25 per month with a 1-year subscription. The individual plan costs more than competitors’ base tier plans at $16.99 per month ($14.17 with 1-year subscription), but it comes loaded with more features typically only found in rivals’ premium tiers. TrustedID only offers a single tier for both family and individual plans, so it’s an all-or-nothing offer. All plans are free for the first 14 days. A subscription nets you the usual basic protections: TrustedID will scan black market websites on the web for your credit card numbers, social security number, bank account numbers, name, and address. Lost wallet protection ensures that if your cards are lost or stolen, TrustedID experts will help you cancel and replace them. You can set up fraud alerts so that lenders must contact you before any new credit is issued in your name. Finally, every account comes with $1 million of insurance to reimburse you for any out-of-pocket costs in the event of identity theft, which is the typical amount. On top of those par-for-the-course protections, users can monitor their credit scores from all three national credit bureaus. This is a significant plus for TrustedID, as credit scores and reports are usually reserved for higher tier premium customers on rival services. You can even view your online credit report during the free trial period at no charge. Credit reports are renewed once per year around the anniversary of your subscription. By inputting your medical insurance information, TrustedID can also help guard against medical benefit fraud. This is a protection often absent from competitors. Driver’s license and passport information are noticeably missing from TrustedID’s repertoire, however. Additional phone numbers and addresses cannot be added, either. TrustedID will work to remove your name from marketing databases, which are used to send out junk mail and phishing scams, including pre-approved credit card offers. 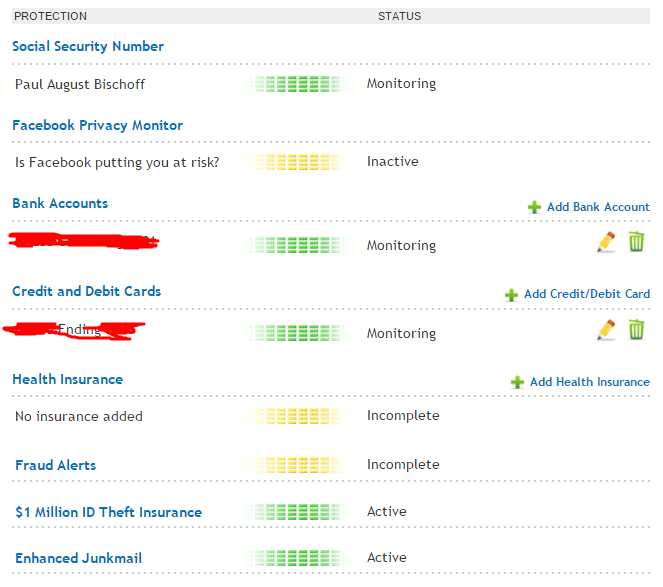 Finally, Facebook Privacy Monitor claims to analyze your privacy settings on Facebook to check for risks. I say “claims” because I couldn’t get it to work. It is supposed to return a “risk scale,” of high, medium, or low and alerts you to any changes in your settings. TrustedID promises not to collect any personal information from your Facebook account. When I clicked on the link for Facebook Privacy Monitor, all I got was a pop up describing the service, but with no means of connecting my Facebook account to TrustedID. I sifted through the entire user portal and even contacted customer service to no avail. It just wasn’t there. Alerts and notifications are sent via email and optionally SMS to your phone. TrustedID claims it can pre-emptively alert you to credit card fraud before or while it happens. It’s up to the customer to contact their bank to actually stop it, however. Fraud alerts place a note on your credit file so that lenders must call you any time an account is opened or money is borrowed in your name. Those who feel they are at high risk can activate, CreditLock, which stops credit bureaus from releasing your credit report to anyone unless you say otherwise. Remember that you must deactivate CreditLock if you want to open a new account, apply for credit, or take some other action that requires a credit score. 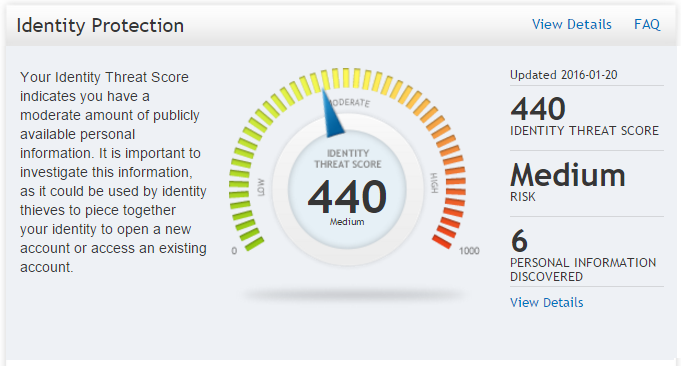 The home page of your account dashboard features a speedometer-like meter with a calculated “threat score.” Because this is a metric invented by TrustedID and not an industry standard, it’s mostly arbitrary. You probably don’t have much to worry about unless the score is very high. In any case, you can see a list of what websites TrustedID has found your information on, and what information appears on those websites. These typically include social media and people finder websites. As it failed to locate my Twitter account, I’m skeptical about how reliable it is. The site will show you a history of fraud alerts placed on your credit file, but there’s no archive of other alerts regarding your credit cards, social security number, etc. Setup is a straightforward process that doesn’t overlook any vital details. Fraud alerts must be set up separately, though. Enter your account numbers, some personal info, etc, and it’s done. Two-step authentication is not an option. Most of the information you’ll want to regularly check appears on the main Overview page of the portal: your threat score, which accounts and other information are actively being protected, and access to your credit reports. As mentioned before, an archive of past alerts and notifications is missing entirely, which seems like a clear oversight. The non-existent Facebook Privacy Monitor wasn’t the only hiccup I ran into during testing. While the site is intuitively designed and fairly easy to navigate, I spotted some typos in the text and a button or two that didn’t function properly. These weren’t critical deal-breakers, but I hesitate to place my trust in a company that can’t put a little more effort into quality control on the user end. The Protection Pack tab lets you print out a PDF of pre-written letters to companies that have stored your personal information online. Just print them out, put them in envelopes, jot down the addresses, and send them off. Each letter will request that your personal info be removed from their databases. Unfortunately the tool doesn’t provide email addresses or online forms where you can file removal requests online, as with Lifelock’s similar feature. The lost wallet tab lets you view and edit the cards protected by lost wallet protection. TrustedID is completely web-based; there’s no mobile app or desktop client. Customer service is very phone-centric; no live chat or ticket submission system here. TrustedID has a customer service email address, but it won’t divulge much information via email (nor should you, as email isn’t the most secure of communication methods). Phone support is not even available 24 hours per day. Customers must call between 9 a.m. and 8 p.m. Central US time. We were able to connect with a representative almost immediately over the phone. You’ll need your name, phone number, birthday, and the last four digits of your social security number handy to verify your identity. We asked about the Facebook issue among other questions, which they were completely stumped by. Overall the staff didn’t seem as professional, knowledgeable, or even polite as some rivals’ customer service. The FAQs section of the website is the only resource and is somewhat limited when it comes to specific inquiries. There are no user forums or guided tutorials. The interface promotes other services offered by TrustedID, but these aren’t intrusive as far as advertisements go. We didn’t receive a single unwarranted email during our testing. For those who want to protect their entire families and receive credit reports all in a single, no-hidden-costs package, TrustedID is a solid option. The price is on par with the premium tiers of competitors that offer similar features and services. Facebook privacy monitor doesn’t work, and a few other details need polishing. Customer service is mediocre but passable.